Restorative Yoga – The antidote to stress is relaxation. Learning to relax is at the heart of living well. Human bodies are ‘wired’ for a physiological relaxation process that can be easily invited by setting up the right conditions. Restorative yoga poses support the body in a way that the physiological principles for promoting relaxation are activated. 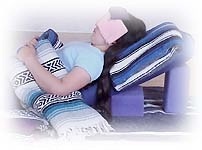 The use of props provide a completely supportive environment for deep relaxation. Restorative yoga is beneficial for heart health, women related issues, circulatory needs, back pain, neck pain, high blood pressure, asthma, headaches, depression, insomnia, recovery from an illness and other stress related dysfunctions. These poses can be easily done and do not require prior Yoga experiences. Each restorative sequence includes supportive forward bends, back bends, gentle twists as well as inversions. An inverted pose can be as simple as putting the legs on a bolster or pillow. This reverses the effects gravity has on the body, especially when a person sits and stands a lot through the day. By changing the relationship of the legs to gravity fluids are returned to the upper body and heart function is enhanced. Each restorative Yoga sequence provides lengthening for the spine, stimulates and soothes the organs and nurtures the nervous system. Special Relax & Renew® classes are offered at different times. See our Events and Workshops Page for details on our next class offering.